PACK EXPO International 2018 attendees and exhibitors can experience this alternative to conventional chain hotels – at an exclusive event rate. Online booking for these Chicago hotels is available for individuals and smaller groups. To book more than 20 rooms, please contact PACK EXPO International’s official hotel partner at packexpohotels@expovision.com or (866) 523-0877. Since 2012, the ACME Hotel Company Chicago has been shaking up traditional notions of boutique hotels. This River North hotel prefers to be affordable and hip instead of expensive and formal. The fun starts right away in the artsy lobby. Later, you can relax with a drink at The Berkshire Room restaurant and lounge or grab a coffee and a pastry at West Town Bakery. Then head up your room in an elevator plastered with music album covers. The rooms carry over the quirky decor and also bring in tech features that you typically won’t find in a traditional hotel. At this downtown Chicago hotel, you can enjoy super-fast 100 MB band-width internet and wireless audio systems. You can even plug in your laptop to the TV for simple video streaming. Standard continental breakfast? Not a chance: cupcakes, popcorn and Snack Boxes are more of the StayPineapple speed. Each guest gets to take home a pair of complimentary fuzzy slippers. Stream audio and video in the comfort of the guest’s room with Chromecast. This boutique line is all about location, location, location and Alise passes that test being right in The Loop and close by the Theater District. Hotel EMC2 is a Marriott hotel “at the intersection of art & science.” Take its restaurant, the Albert, which is a culinary celebration of Albert Einstein. It features global cuisine made with local ingredients to create adventurous menus for the bar, brunch, dinner and dessert. No matter the time of day, the Albert delivers dishes that are delicious to the senses. These are Instagram-worthy meals! But what would a hotel that nods to Einstein’s legacy be without some cutting-edge technology? The concierge has two robots for room deliveries and each room has an Amazon Echo. This hotel just opened last year and its sure to become a Chicago boutique favorite. PACK EXPO International registrants can earn Marriott Rewards with their reservation; just add your account number in the “Notes” section when booking. Stay at a Chicago historical landmark loaded with modern amenities. The Inn of Chicago Mag Mile doesn’t rock the boat with their classic design, but why mess with a timeless look? It also doesn’t hurt that the hotel has had massive renovations recently. Inside the comfortable rooms, historic black and white photos celebrate the hotel’s iconic location. Don’t forget to take in a great view of downtown from the 22nd floor Skyline Terrace. Listed in the Conde Nast Top Hotels in Chicago: Reader’s Choice Awards 2017, The James Chicago is a vibrant, modern hotel. It holds just under 300 luxury guestrooms and suites with amenities like HD Smart TVs and an in-room pantry with local goods. Its newly renovated lobby (pictured above) has a welcoming fireplace, The James Club “creative space” and shared work desks. This Magnificent Mile hotel is close to the Michigan Avenue Shops and Millennium Park. This 4-star hotel offers a winning boutique experience: prime location and contemporary accommodations all set against a backdrop of historic architecture. With just 144 deluxe guestrooms, the attention to detail and service is not missed at Silversmith Hotel Chicago Downtown. 12-foot ceilings and marble bathrooms give the rooms an upscale vibe. The hotel was listed in TravelMag’s “The Best 4-star Hotels in Chicago.” Its downtown Chicago Loop location is near attractions like the Art Institute of Chicago and the Theater District. Step into this European-inspired hotel that has strong roots in the beginnings of The Magnificent Mile. The Whitehall Hotel is nearly 100 years old, but it’s not stuck in the past. This is not only a 4-star hotel, but a pet-friendly 4-star hotel. 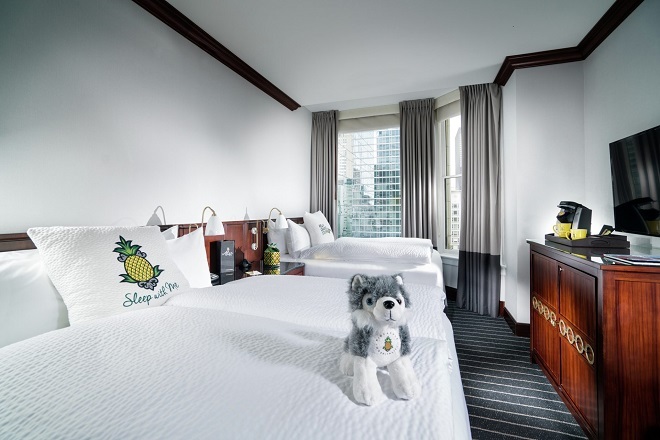 Yes, guests can bring their furry friends (30 pounds and under) to their Chicago room! Head to the hotel’s Italian restaurant, Fornetto Mei, for breakfast or dinner. Or try their Chinese restaurant, Mei’s Corner, which playfully fuses Mandarin, Szechuan and Taiwanese cuisines. Want to see more of the PACK EXPO International 2018 room block? Note: The last date to book the guaranteed lowest rate for PACK EXPO International 2018 is Friday, September 7th. After this date, rates may increase and hotel rooms may not be available.